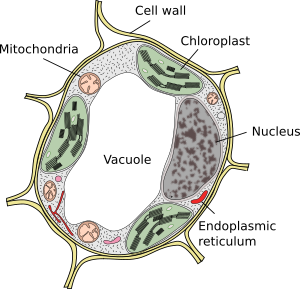 Diagram of a typical parenchymatic cell with its primary cell wall. One of the most distinctive characteristics of plant cells with respect to those of animals is the cell wall, which some authors consider as the extracellular matrix of plants. It is the structure that R. Hook saw and drew when he gave name to the cell. The cell wall is located externally to the plasma membrane, is synthetized by the cell itself and consists mainly of cellulose, in addition to other polysaccharides and glycoproteins. Different cell types present differences in composition and organization in their cell wall, depending on the function they are developing. In fact, the different cell types of plants can be identified by the characteristics of their cell wall. The cell wall has a mechanical function. It is responsible for the shape and size of plant cells and provides them with both structural support and protection as an exoskeleton. As a result, it is also responsible for the rigidity of the plant and for keeping its aerial structures and the organs that form it upright. Another of its main functions is to be a means of communication and transport of molecules and water between cells, both between nearby and distant cells. It also participates in the fight against pathogens being able to trigger defense responses, or give texture to the tissues of the fruits. Morphologically, the cell wall is formed by layers or sheets. All cells have at least two: middle lamella and primary wall. The middle lamella is synthetized and shared by cells that are contiguous with each other, while the primary cell wall is synthetized and belongs to each cell. In some plant cells, a third thicker layer called secondary cell wall is deposited. Most of the wood in the trees correspond to the secondary cell wall. Images of cells with primary cell wall and with secondary cell wall (the latter also have primary cell wall, although it is not visible). All of them have middle lamella, which is not distinguished in the images. They correspond to conductive vessels: the one on the left stained with toluidine blue and the one on the right with safranin - fast green. Diagram of the primary and secondary cell walls. 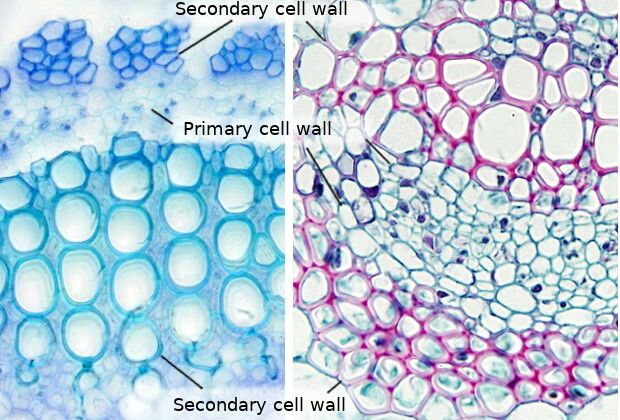 S1, S2, and S3 are layers of the secondary cell wall. The outermost layer of the cell wall and the first to form is the middle lamella. It acts as a glue that binds neighboring cells. It is the only layer synthetized and shared by two contiguous cells. It has an amorphous appearance and is very thin; its thickness is close to the resolution limit of the light microscope. Nevertheless, it does not appear as a well-defined layer even with the electron microscope. In some tissues, there are intercellular spaces and, therefore, the middle lamella has one of their surfaces free. The middle lamella consists mainly of pectins, although it can be lignified in those cells that have a secondary cell wall. The primary cell wall is the first clearly visible layer of the cell wall and is located between the plasma membrane and the middle lamella or, in some cells, between the secondary wall and the middle lamella. It is responsible for the initial shape and size of the plant cell, and determines its subsequent changes in shape and size. It appears in all plant cells and originates during cell division, but the primary cell wall is also synthetized during growth in cell size. In addition, through the life of the cell there is a recycling with degradation and new synthesis of the components of the primary cell wall. In cells that are metabolically active, secretory, or capable of dividing, it remains the only component of the cell wall, in addition to the middle lamella. Plant cells stop growing when the primary cell wall become rigid, which may be due to a change in their composition. Primary cell walls (arrows) in different tissues. The shape and size of the cells are conditioned by their cell wall. The cell wall is a barrier to the free diffusion of molecules between cells; of course, it is much less permissive than the extracellular matrix of animals. However, cells need to communicate with each other. To do this, plant cells create channels that cross the cell walls and allow direct communication between adjacent cytoplasms. These channels are called plasmodesmata. With very few exceptions, all cells in a plant are connected with their neighbors by plasmodesmata. This connection is literal, that is, the plasma membranes of neighboring cells are continuous with each other, so we could say that a plant is a large syncytium. Plasmodesmata can appear concentrated in certain areas of the cell wall forming what are called primary pore fields, which form depressions in the cell wall since its thickness is smaller. Plasmodesmata in the primary cell wall. In the lower part of the figure, there is a drawing of an electron microphotography. In the primary cell wall there are also areas with a greater thinness, although they do not produce interruptions in it, called primary pits; these structures may appear isolated or grouped in areas called primary pit fields. Plasmodesmata are usually concentrated in primary pit fields. The primary cell wall is composed, considering the dry weight, by 25-30% of cellulose, 30% of hemicellulose, 35% of pectins and 1-5% of glycoproteins. The proportion and types of components that constitute the primary cell walls varies between cell types. It has been estimated that more than 2000 genes are required for the synthesis and remodeling of the primary cell wall. Cells with primary cell wall are usually metabolically active. Usually the primary cell wall is thin, around 0.1 µm thick. In addition, the cells that develop secondary cell wall usually have thin primary cell wall. Only a few cells achieve thick primary cell walls, such as some endosperm and collenchyma cells. In any case, the thickness can change according to the conditions in which the cell is located. In the primary cell wall there are pores (not to be confuse with plasmodesmata) with a diameter ranging from 4 to 8 nm, which allow the passage of water, ions and small molecules such as sugars and amino acids, and hormones. Cellulose. Cellulose is the main component of plant walls. It is a linear polysaccharide formed by glucose monomers linked by β(1-4) bonds. The formula is (C6H10O5)n, where n can be greater to 500 per polysaccharide chain. The long cellulose molecules associate with each other through hydrogen bonds and Van der Waals forces to form structures called cellulose microfibrills, formed by 50 cellulose molecules oriented with the same polarity. Microfibrills are associated with each other through bonds formed between them and other carbohydrates, mainly hemicellulose and pectins, which result in fibrils and cellulose fibers, visible under the light microscope. The cellulose fibers can measure about 0.5 µm in diameter and 4 to 7 µm in length. The strength of cellulose fibers is similar to that of steel and the bonds between cellulose molecules by hydrogen bonds make the cellulose microfibrills have crystalline properties in some regions, while the rest acquires paracrystalline properties. Organization of cellulose molecules. The glycoproteins have not been represented. The detailed organization of the cellulose microfibrills has not been solved yet and two models were proposed. In one of them (model 2) pectins play a predominant role. As with hyaluronate (hyaluronic acid), cellulose is synthetized in the plasma membrane thanks to the action of cellulose synthase, a transmembrane protein with an amino acid sequence that crosses 8 times the plasma membrane. About 30 genes code for different isoforms of cellulose synthase. This enzyme collects the activated glucose units (UDP-glucose) in the cytosol, makes them cross the membrane and binds them in the exterior of the cell. Up to 36 cellulose synthase enzymes bind at a point on the plasma membrane to form the so-called cellulose synthase complex that is rosette-shaped, and is so large that it can be observed with the electron microscope. Each rosette can synthetize up to 36 molecules of glucose simultaneously. The cellulose molecules that polymerize nearby are joined laterally by hydrogen bonds. These new cellulose molecules are also associated with the microfibrills that had previously formed piles of these microfibrills, fibrils and cellulose fibers. Molecular composition of the xyloglucan, the most common hemicellulose. Hemicellulose is actually a family of polysaccharides of 200 to 500 monosaccharides. The type of hemicellulose that appears in the cell wall varies greatly between tissues and cell types. It is synthetized in the Golgi apparatus and is transported to the plasma membrane in vesicles, where it is released by exocytosis. Xyloglucan is the most frequent molecule of hemicellulose. Structurally, hemicellulose is similar to cellulose so it can establish hydrogen bonds with it. As the hemicellulose molecules are synthetized, they coat the cellulose microfibrills, helping to the cohesion to form cellulose fibers. Pectins form a very diverse group of acidic polysaccharides synthetized in the Golgi apparatus and secreted into the cell wall. Together they form a gel-like structure that is located between the cellulose microfibrills. They seem the main responsible for the formation of pores that allow the diffusion of small molecules through the primary wall. Pectins are more abundant in the dicotyledons that in the monocotyledons. For example, grasses contain only traces of pectins. Pectins appear absent in the secondary cell wall (see below). 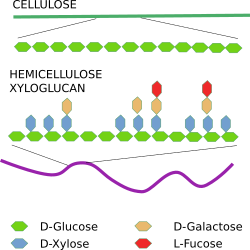 Glycoproteins of the cell wall are usually rich in proline, hydroxyproline and glycine, amino acids that are found in much repeated sequences. The type of glycoprotein usually varies a lot between cell types. One of the most common family of glycoproteins are extensins, which are rich in prolines. The glycoproteins have an apparent structural function, although there are also enzymes such as peroxidases, laccases, phosphatases, cellulases, pectidases, among others. Callose is a substance that is deposited between the plasma membrane and the cell wall; then, it cannot be considered strictly as a component of the primary cell wall. It is mainly located around the openings of the plasmodesmata (see figure). The callose is synthetized, released and deposited in response to cellular stress, either by wounds or by pathogens, and its mission is to obliterate the plasmodesma channel and cut or decrease the communication between neighboring cells. It also appears in other places with less clear functions, such as in the pollen tubes or in the cell plate during cytokinesis. Some specialized cells have other particular molecules. For example, cutineand other waxy polymers are deposited in the free surface of the epidermal cells forming a structure called cuticle (see figure). This layer, which can be very thick, prevents the loss of water and protects against pathogens. The suberin is deposited in the cell wall of other cells such as those of the suber or cork of the periderm, in the root endodermis and in cells that surround some nerves of the leaves. Suberin has two domains, one is inserted into the primary wall and the other is between the primary wall and the plasma membrane. 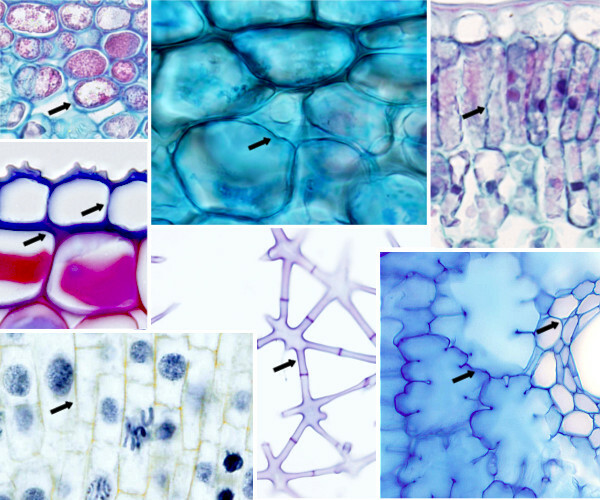 It can be said that the primary cell wall is a framework of cellulose microfibrills, connected by hemicellulose molecules and embedded in a pectin matrix. The three-dimensional organization of cellulose, hemicellulose and pectins is not clear yet. Several models have been proposed and the most cited assumes that hemicellulose molecules bind tightly to cellulose molecules by hydrogen bonds. However, recently it has been seen that hemicellulose does not have as many connections with the cellulose as was thought and that pectins seem to play a more important role in the compaction of the cell wall. For example, it seems that pectins have more links with cellulose than hemicellulose with cellulose. Pectins help to hydrate the primary cell wall. When the cell wall grows, it is necessary to distinguish between growth in thickness (deposition of successive layers) and increase in length, when the cell wall increases its surface and the cell increases in size. The growth of the plants is mainly due to cell size growth, which is produced by the force of the hydrostatic pressure, that is, by the force exerted by the water from inside the cell outwards on the primary cell wall. Although it depends on the cell type, cells can grow up to 10 times their size. In some cases up to 100 times. The cells can grow homotrophically, the entire surface of the cell wall expands although it can be at different rates, or heterotropic, only a part of the surface of the cell wall expands (for example in the pollen tubes, or in the trichomes). A cell grows where there is less resistance, which depends on the resistance opposed by the cell wall. This conditions where the cell of the plant will grow, which will determine, for example, the shape of the stems and leaves, or that they will grow towards a light source or not. The resistance of the primary cell wall is determined by the orientation of the fibers of cellulose and by the consistency of the primary cell wall assembly. The primary cell wall is anisotropic, a consequence of the irregular orientation of the fibers of cellulose. These fibers are shorter and more irregular that in the secondary cell wall (see below). Usually this irregular orientation occurs in cells that grow or have grown in all directions. When a cell expands in a preferred direction, the microfibrills of cellulose are oriented perpendicular, in the manner of rings, with respect to the growth axis, and the external ones, which were already there, are arranged longitudinally to that axis. It is normal to find layers in the primary cell wall where the microfibrills are oriented helically and with a certain rotation of angle with respect to the next layers. 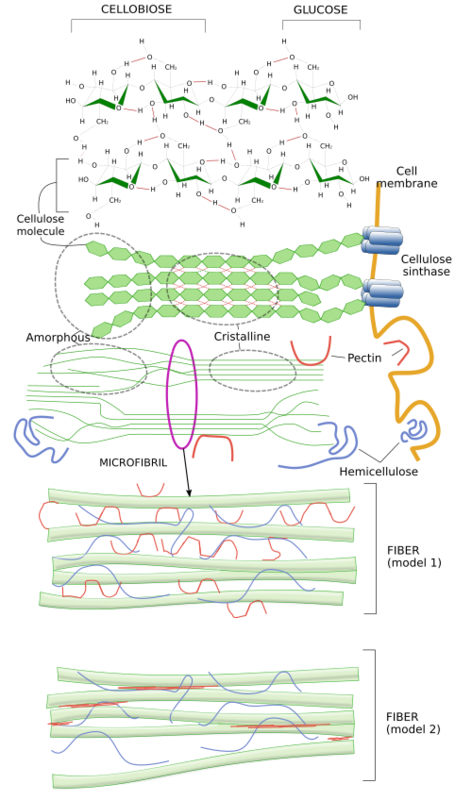 An interesting aspect of the primary cell wall synthesis is how the cell manages to orient the molecules and microfibrills of cellulose, since this will determine the orientation of the fibrils and fibers of cellulose. 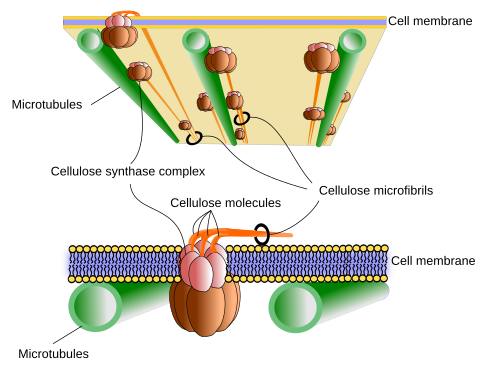 The orientation of the molecules of cellulose is conditioned by their synthesis and by how they are deposited on the plasma membrane, which is determined by the spaces through which the enzymatic complex that synthetizes it can move through the plasma membrane: the rosette of cellulose synthase. One theory suggests that this movement depends on the orientation of the cortical microtubules that are located just under the plasma membrane, in the cytosol. These microtubules act like barriers that cannot be crossed by the rosettes of cellulose synthase. The enzymes move through the membrane, driven by the polymers of cellulose that are synthetized but only where microtubules allow them. In this way, by depolymerizing and polymerizing microtubules again, the cell can control the orientation of the fibers of cellulose. It has been shown that microtubules can rearrange in a matter of minutes to accommodate these changes of orientation. Other extracellular and intracellular factors can also condition the direction of movement of these enzymatic complexes. The consistency of the cell wall also determines how the cell will grow. A softening or relaxation of the cell wall must be produced by secretion of substances to certain areas of the wall. It has been observed that it becomes softer in certain places through the chemical modification of the pectins and by acidification; it is in these places where there is also less resistance and, therefore, where the cell grows. Pectins play an important role in the relaxation of the cell wall for growth. They can be hydrated a lot by adding plasticity to the wall. In particular, during growth, enzymes are released that change the molecular form of the pectins initially released or different types of pectins are released directly. All this leads to a relaxation of the cell wall and promotes cell growth. Calcium is important for pectins since it favors the union between them, and is released after the elongation of the cell. For example, the walls of meristematic cells are poor in calcium. Auxins, a class of plant hormones (or plant growth regulators), cause acidification of the cell wall and its relaxation by activating the expansins, the methyl-esterase of pectin and the endoglucanases. The expansins do not have enzymatic activity and their effect seems to hinder hydrogen bonds, while the endoglucanases decrease the number of bonds between cellulose-cellulose and cellulose-hemicellulose. Although microtubules seem involved in determining how a cell grows, it has been found that non-uniform (anisotropic) growth begins to be detected even before cellulose fiber orientation occurs. Prior to the organization of the microtubules and the orientation of the cellulose fibers, a local or irregular alteration of the pectins takes place. Therefore, the initiation of heterotropic growth would not begin with the reorientation of the microtubules, but with the modification of the pectins. It is even suggested that the orientation of the microtubules would be a consequence of the alteration of the pectins and, therefore, a secondary response. 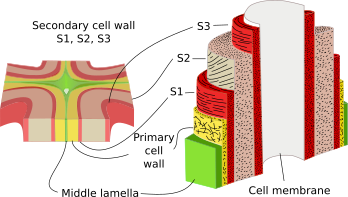 Those cells that have the mission of support and those conductors that are part of the xylem develop an additional wall layer called secondary cell wall. It is deposited between the plasma membrane and the primary cell wall and the process involves the synthesis of numerous layers of cellulose fibers that are added one after the other by a mechanism called apposition. The synthesis of the secondary cell wall begins during the final phase of the growth and extension of the primary cell wall. Once the cell wall is synthetized, the cells die by apoptosis. They are probably one of the few cell types whose function, mechanical resistance and sap transport, is performed when they die. Plants that grow in thickness and height need a great support and develop what we call wood. The secondary wall is the main component of the wood. The secondary cell wall is composed mainly of cellulose (40-60% of the dry weight), hemicellulose (10-40% of the dry weight, especially the xylan) and lignin (10 to the 35% of the dry weight). It has very few pectins and lacks glycoproteins as structural proteins and enzymes, or at least they are not abundant. The proportion of cellulose in the secondary wall is greater that in the primary wall and it also has hemicellulose in lower proportion. A typical substance of the secondary cell wall is lignin, which is the most abundant biopolymer in plants after cellulose. The lignin is deposited between the microfibrills of cellulose to give consistency. This molecule allowed the plants gain a consistency and resistance hitherto unknown. When lignification of the secondary wall occurs, part of these molecules can also be deposited in the primary cell wall and in the middle lamella. Even in conifers, the largest amount of lignin is found in the middle lamella of the conductive cells. The cross-linked framework that these molecules form seems to favor the elimination of water from the wall and, therefore, the access of hydrolytic enzymes (see more about lignin here). 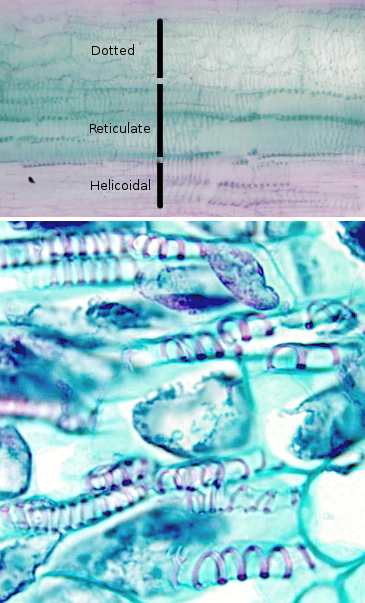 Orientation of the fibers of cellulose in the different layers of the cell wall. The secondary wall have a thickness of 2 to 10 µm, is poorly hydrated and is rigid. Its thickness is greater than that of the primary wall, sometimes so thick that it obliterates the interior of the cell. 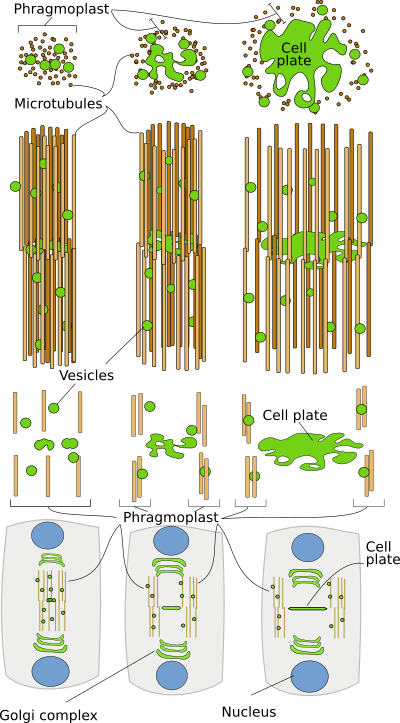 In some cells, three layers can be distinguished in the secondary cell wall: S1, S2, and S3, each with a different orientation of its fibers of cellulose. Usually layer S2 varies in thickness between cell types. Cellulose fibers are usually arranged helically. When the secondary wall develops, the rest of the cytoplasm adhere the layer S3 forming a layer called the warty layer, due to the irregularity of its surface. The secondary cell wall deposition is not very regular so there are interruptions in it. Sometimes, it is possible to find cells with a part of their wall that is secondary and another part that is primary. 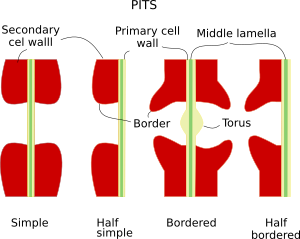 Diagram showing various forms of thickening in the cell walls of the conductive cells of the xylem. Thickenings of the secondary cell wall. In the image below, helical thickenings appear more or less compact. The irregular deposition of secondary cell wall on the cell surface creates irregular structures that are characteristic of some cell types. For example, the cells of the protoxylem and of the metaxylem present a thickening of the secondary wall that is arranged helically along the cell. This arrangement resembles the tracheae of the insects and thus the conductive cells of the xylem are called tracheal elements. 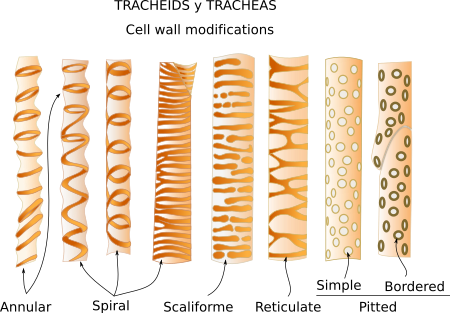 While in the secondary xylem, cells there have other types of irregularities. Although the entire cell may be surrounded by a secondary cell wall, there are always interruptions or channels in it that are called pores or pits, which originate when the secondary cell wall is being deposited. These pits are created simultaneously in the two neighboring cells, leaving a channel that allows to communicate the interior of both cells. A thin membrane, which is called membrane of the pit, separates the two aligned pits of neighboring cells; this membrane is formed by the middle lamella and the primary walls of the two cells. The pits, one or more, are formed where there were primary pits in the primary cell wall. The pits have different morphology. In the simple pits, the pit chamber or hollow area that crosses the cell wall has a similar diameter over its entire length or a little wider in the pit apertures. These pits are found in parenchyma cells, extraxilar fibers and sclereids. The bordered pits are those in which a ridge is formed in the apertures, half bordered pits when only an aperture shows the ridge (typically established between conductive and accompanying cells) and bordered with “torus” are those in which in the middle lamella there is a thickening of the primary wall called a bull, which acts as a valve. The bordered pits with “torus” are absent in flowering plants (angiosperms). On the other hand, there are pits called blind when the pit opens to the intercellular space; that is, it has no complementary pit. A new plant cell does not generate its entire cell wall completely from scratch, that is, it is not born naked. When a cell is going to divide, its two daughters cells inherit all the cell wall that produced its progenitor except in the area where the cytoplasms will separate. The formation of this cell wall from scratch begins at the late anaphase of the mitosis, beginning with this the cytokinesis or division of the cytoplasms. The first thing observed during the cytokinesis of plant cells is the transport of vesicles from the Golgi apparatus with content to build the new wall, mainly polysaccharides and glycoproteins. This transport is given from the two zones close to the nuclei to the intermediate zone where the new wall will be formed. The vesicles are transported by motor proteins along bundles of microtubules remaining from the mitotic spindle. There is a bundle for each nucleus and both bundles overlap in the intermediate zone. In this division zone, there are also actin filaments oriented perpendicularly to the microtubules. The set of microtubules, actin filaments, and vesicles is called phragmoplast. The phragmoplast is the structure that is responsible for forming the new cell wall. When the vesicles reach the intermediate zone of division, where the new cell wall will form, they fuse together to form a plate-like structure that will separate the two cells and that is oriented perpendicular to the mitotic spindle. This plate is called a cell plate. The cell plate grows in a centrifugal manner, that is, the center of the plate is formed first and then more material is added to the edges so that it grows in extension, but not in thickness. The phragmoplast then adopts, by depolymerization and polymerization of new microtubules, an annular form and the vesicles are added in the periphery of the cell plate. Different phases of mitosis from prophase (left) to telophase (right). It can be observed how a new cell wall is gradually created that separates both groups of chromosomes, which will form the nuclei of the daughter cells. This structure under construction is called phragmoplast (arrow). It is also seen in this figure. Formation of the new cell wall thanks to the activity of the phragmoplast, which is formed by microtubules belonging to the two daughter cells; they transport vesicles from the Golgi apparatus to the central plate. The phragmoplast becomes increasingly peripheral until it touches the original wall of the stem cell and the central plate merges with that wall. The cell plate edges will be extended, making the cell plate grow, until they come into contact and merge with the cell walls parallel to the mitotic spindle that the mother cell already had. In this way, each daughter cell is completely surrounded by a cell wall. The cell plate, with the arrival of more substances from the Golgi apparatus, especially pectic substances, will be transformed into the middle lamella. It seems that once the contact of the edge of the cell plate with the middle lamella of the mother cell has occurred, it is when there is a transformation of the cell plate in the middle lamella. The growth of the middle lamella is mainly centripetal, that is, it will form from the edges to the interior, where the cell plate began to form. The middle lamella is the layer of the cell wall that is shared between the two daughter cells and both contribute to its formation. It is a very fine layer to which later the others will be added to form a mature cell wall. Regardless of whether the cell wall is synthetized again or new layers are added during maturation, the process is always from the outside in, that is, the more recent parts are always closer to the plasma membrane. An interesting aspect of the formation of a new cell wall during cytokinesis is where and how the division plane will be oriented. For example, if it will be periclinal or anticlinal, or any other orientation. 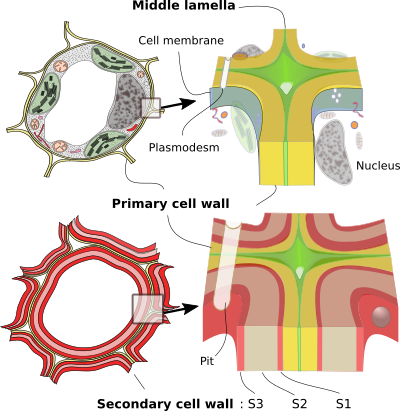 The position and orientation of the dividing plane, and therefore of the cell plate, is established even before the formation of the mitotic spindle. In the majority of the cells, before the formation of the mitotic spindle, a network of microtubules, actin filaments and endoplasmic reticulum cisterns appear in the cortical region of the cytoplasm near the plasma membrane, forming a belt or ring called the preprophase band. This ring disappears when the mitotic spindle begins to form. However, the cell plate will be formed where this preprophase band was located. In such a way that this initial band conditions the formation and orientation of the mitotic spindle. During cytokinesis, intercellular spaces are also formed; they are important for the diffusion of gases and store secretion substances. Most of these spaces are formed when the growth edge of the new middle lamella reaches to the proximities of the primary cell wall of the mother cell. This growing middle lamella branches out and then two growth fronts are created that will cross the primary cell wall of the mother cell. When these fronts reach the middle lamella of the mother cell, a space surrounded by middle lamella is created. This space will become an intercellular space. During the maturation of tissues, the intercellular spaces increase, being greater in adult tissues. The normal form is by schizogenesis, that is, by a physical separation between cells produced first by degradation of the middle lamella that allows physical separation, and by a subsequent cell differential growth. These spaces are very evident in the spongy parenchyma of the leaves. 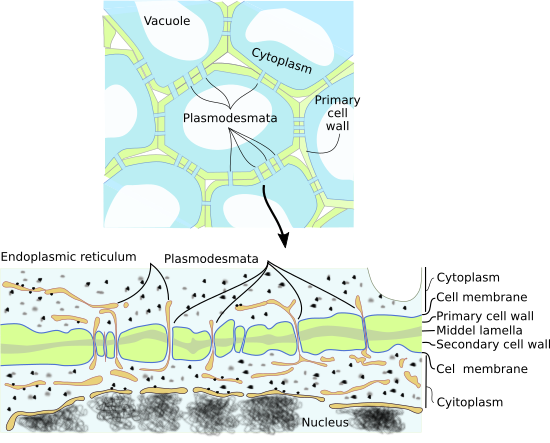 During the formation of the cell wall, cisterns of endoplasmic reticulum are trapped; these cisterns inhibit cell wall formation and remain as discontinuities, which will later become plasmodesmata. Evert RF. 2006. Esau's plant anatomy: meristems, cells, and tissues of the plant body: their structure, function, and development, 3rd edition. John Wiley and Sons, Inc. ISBN: 9780471738435. Hartholt J, Suttangkakul A, Scheller HV 2010. Biosynthesis of pectin. Plant physiology. 153: 384-395.